15x8 0 offset fitment? Low offset rim pic request. Curious about picking up a set of rims that are 15x8 with an offset of 0. Wondering what I need to do to make it fit without rubbing? I plan on rolling the fenders. Anyone got any pics of their low offset (+15mm and down) wheels on their first gen rx7? I'm looking for the largest, widest, lowest offseted wheel size I can get to give me the most aggressive stance while filling the wheel wells. I enjoy the look of a 1st gen that has a bit of the tire bulging out from the fender. 15X8 Epsilons, with 4 to 4-1/2" backspace. This is what started the widebody project. The 15X7" wheels/tires in the front didn't stick out as much, but caught both fender lips and bent them out. Body is sitting on Eibach Pros. Rear had less than an inch of clearance between the tire tread and fender lip. If you go with this type of rim, you'll need to radius the fender lips and add flares. 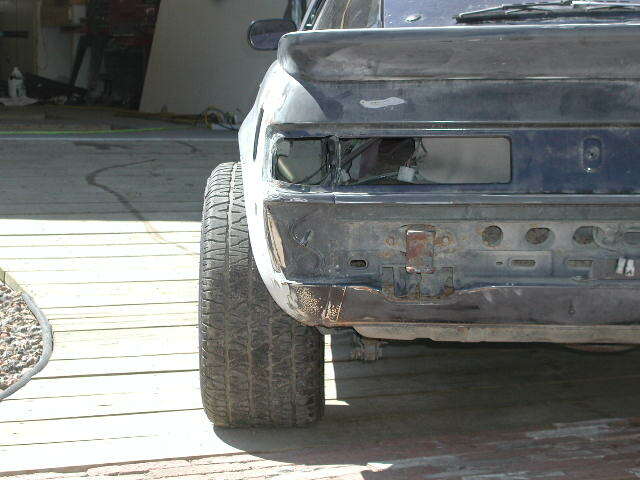 I have a writeup in the archives on how to trim out the fenders. Anyone have a pic of 15x7, 0 offset ? I have a feeling that with a set of these the fronts will stick out of the fenders more than the rear, true? Thanks man, I'll be using that archive. Definitely plan on trimming or rolling the fenders then I'm ordering a set of super ZG's. Right now I'm really torn between the sizes 15x7 (in either +15mm or +0mm) or 15x8 (+0 offset). The thing that confuses me is how having 4x110 to 4x100 or 4x114.3 wheel adapters will effect the fitment and drive-ability. I'm planning on the wheel adapter to at least be +25mm to +35mm. I haven't had much luck in finding too many companies that make 4x110 wheel adapters though. Last edited by bd83fb; 01-25-10 at 11:00 AM. Adapters are out there. I had a great site bookmarked but but after a couple of comp crashes I've lost if, keep looking. You want an adapter that's about an inch+ thick. Keep searching and you will find it. My archive writeup is listed below. Since I am using wheel adapters to change my bolt patern, and adapters also act as spacers if I am thinking right, what size offset would it be safe to go with? I am now considering more of a higher offset (20mm-38mm). I have been told to go with an adapter that is atleast 25mm. Correct me if I'm wrong, but if I had a 15x7 wheel with et 38mm would I be running 13mm offset all around with adapters of 25mm?